The 24S and 24S-D both feature redesigned front grills making them more unobtrusive than ever before. 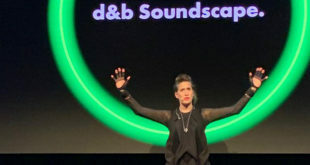 d&b audiotechnik has made two new additions to its xS series of point source loudspeakers. The 24S and 24S-D, along with the arrayable xA-Series, all feature redesigned front grills making them more unobtrusive than ever before. 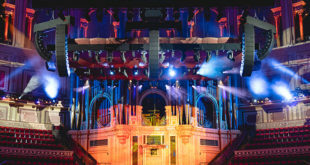 The new units are ideally suited for permanent applications including nightclubs, live performance venues, houses of worship, multipurpose centres and sports venues. “The 24S, 24S-D and 21S-SUB are designed to set and forget. 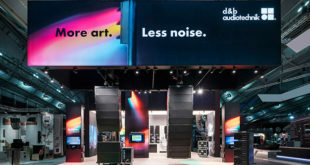 They meet the exact day to day demands of permanent installation with minimum fuss and maximum reliability,” explained Wolfgang Schulz, product manager of installation products at d&b. Differing only in horizontal dispersion, with 75° x 45° and 110° x 45° (h x v) respectively, the 24S and 24S-D house two 12inch LF drivers in a dipolar arrangement and a single hornloaded 1.4” exit compression driver. This HF horn is rotatable, meaning the 24S/24S-D can be mounted either vertically or horizontally. By separating the LF drivers, they achieve constant directivity control in the same plane as the dipole down to approximately 500 Hz. The units also have a frequency response extending from 55 Hz to 18 kHz. With this extended bandwidth, the 24S and 24S-D point source loudspeakers are a truly stand-alone option, while for applications with bass heavy programme material, the new 21S-SUB provides additional low end support from a conveniently small footprint.